Located in Southeastern Asia, Cambodia is a beautiful country steeped in tradition and a rich cultural history of sending flowers for all occasions. Flowers here are usually gifted on the Cambodian New Year (Chaul Chnam). Unlike most other cultures, Cambodians do not celebrate birthdays. In fact, many older people may not know the exact date of their birth. A small gift is to be taken if invited to someone's home for food. A nicely presented fruit basket, sweets, pastries or flowers will make the host happy. Gifts here are usually wrapped in colorful paper and not White. When giving flowers or gifts use both hands. Remember, gifts are not opened when received, so make sure the flowers are fresh and gifts are not damaged. Carnations, Lilies & Roses are the best selling flowers here. Send flowers same day to Cambodia using our local florists & flower shops. Order by 12 noon. Send Mother's Day Pink Roses, Lilies, Carnations & Special Gifts to Cambodia. Send Roses, Carnations, Lilies throughout Cambodia for occasions like Birthdays, Anniversaries, Funerals, etc. Enjoy affordable flower delivery across Phnom Penh, Battambang, Prey Veng, Kampong Cham & nationwide delivery. How do i send International Flower Delivery to Cambodia? 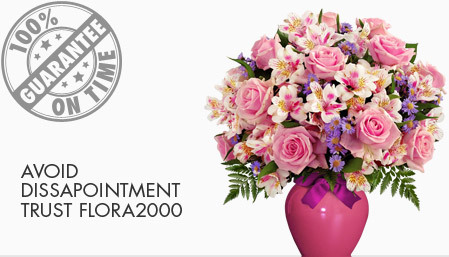 Flora2000 has transformed International flower delivery to Cambodia into a fine and effortless art. With our efficient flowers & gifs delivery services worldwide; you are sure to find the perfect expression of your message to your loved ones. Be it Roses, Lilies, Carnations or Cakes, our gifts are sure to make both the sender and the receiver happy. We make sure the gifts you give reflects what you feel about the receiver. Handpicked Unique Gift Ideas for Mom. Fresh Roses, Lilies, Carnation & Gift Hampers specially crafted for your mum. Order NOW for guaranteed delivery on Mother’s day in Cambodia.